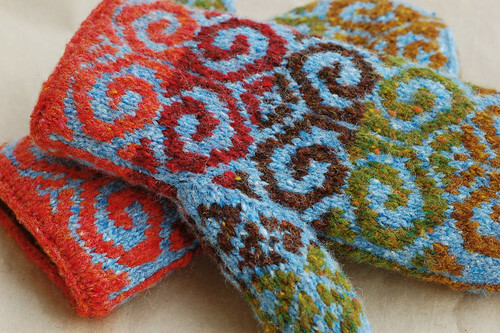 The Fiddlehead Mittens pattern testing has been going well. Test knit in Rowan Scottish (Harris) Tweed DK by Stacie. Lining is Blue Sky Alpacas Brushed Suri (hubba hubba). Made by Julia from Berroco Ultra Alpaca Light with a Rowan Kidsilk Haze lining. Begin decreasing for top of mitten. *K4, K2TOG* around, K3, K2TOG. I’ll put this on the mitten kit shop page and on the patterns page. The pattern is coming very soon! Pattern? Yes, please, please, please! I wonder if could just bribe Julia to make me a pair, since I don’t think i could ever make them as well. Amazing pattern, fabulous test knitters. Wow. I know i’m gushing, but I can’t really help it — I’m so utterly awed by your talent. Those look fabulous! You have some divine test knitters and a gorgeous pattern. I love the lime green lining peeking out of the blue ones. oh! I can’t wait for the pattern to go on sale!! They are absolutely beautiful!! So lovely in all yarns knitted so far. A sure sign of an expertly well designed pattern. Can hardly wait for the pattern. I hope I can knit ’em – I’ve never knit a pattern like this or lined something. L-O-V-E with those first mittens… hearting the colors!! Those are some of the prettiest mittens out there! Can’t wait for the pattern. Lordy lordy, man oh man those mittens a fabuloso. I’ll look for you at the SPA! wow! I am dying to get my hands on this pattern. I’ve coveted it since I saw the first pictures of the ones you knit for your mom. I’m drooling over my laptop here! Love them!!! The colors are absolutely amazing, and so perfect for the pattern. Can’t wait to knit these! The test mittens are love-er-ly. Looking forward to the pattern. Those mittens are positively breathtaking! Beautiful, beautiful work. very pretty, I love it, and want this kit! let us know when it’s ready! Love these mittens! I wonder if I could make them into pot holders if I used a larger size…so cool! I think I’m going to die. Too much cute! It’s this kind of knitting pics that makes my day. I love the ones made w/ the Berroco Ultra Alpaca Light – there’s something about the non-tweed of that yarn that really lets the pattern itself shine through and doesn’t compete. I can only imagine what the Kidsilk haze lining must feel like!!!!!!!!!! I’m jealous that you get to go to Freeport! I miss the old home state. 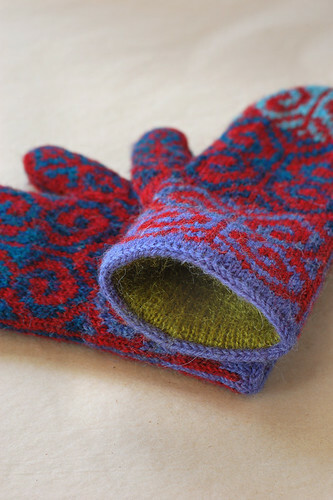 You ought to be able to sell a lot of fiddlehead mitten patterns. Won’t be long before it’s fiddlehead season in Maine! Sign Up for the Fiber Club Waiting List Here! All photos and content © Adrian Bizilia and Hello Yarn. All rights reserved.